Super Hero Boy: A safe place to sleep, a safe place to play! A safe place to sleep, a safe place to play! If your in the market for newborn toys/gear the first thing I find from especially first time parents is being overwhelmed by all the choices. I know when I was first shopping for Connor the choices in playmats alone was so overwhelming I ended up picking a playmate purely for looks which backfired as Connor spent most of the time in it screaming his head off. Even worst I ended up buying too many products, more than we could have ever used, and so many of his toys and gear went untouched. Ironically enough I've spent the last few weeks cleaning out the attic of all the baby gear and some of it ended up getting sold to help pay for diapers as to be honest with you if we didn't use it with Connor the odds are we'd not use it for this one either. I think the biggest misconception parents have is that you have to buy a dozen products when really just one would do the trick. I saw my cousin get suckered into this just recently when she had her first baby, hey I did too so I'm not judging! You think you need a tummy time mat, a crawling mat, a bassinet, and tons of rattles. What if I told you there is one playmat on the market that I know of that does all of the above? Heh. Brilliant eh? The Bright Starts Baby Playplace by Kids II is all of those things. Lay it flat out and its a traditional playmat, the kid Connor liked most as truthfully all those hanging things frustrated him to no end at first. 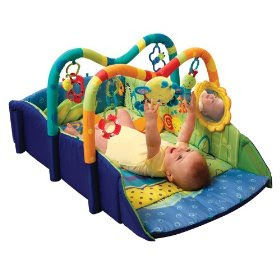 Once the baby is a little older you can flip up the sides and hang the bars across and use it as a playmat with hanging toys or even flip up three sides and make sort of a box for tummy time where all the toys are lined up at one end. All the while if you flip up all four sides you end up with a nice secure floor nap area which will keep baby from rolling out. Perfect for napping or just a more secure play area. Lastly once your little munchkin starts crawling you can flip up just the sides and leave the front and back open and it makes the perfect little crawling tunnel with the bars down the middle. Tada, didn't I just say you could have one product that would serve the purpose of playmat, tummy time mat, bassinet, crawling tunnel, and more? Oh lets not even forget the fact that the Bright Starts Baby Playplace comes with seven removable toys and rattles which in all honestly is enough for any baby's collection. The best part is the Bright Starts Baby Playplace will save you a ton of money. If you went out and bought all those products you'd easily spend at least $200 even if you bought the more modestly priced items. The Baby Playplace is priced pretty similarly to many of the other more high end baby playmats at around $79.99. I'll be perfectly honest though, the biggest reason I really love this product is the fact that its ONE product. With two kids in a two bedroom house storage is at a premium and if one product will serve us from newborn to crawling why waste the space to store five products instead? That alone is priceless as far as I'm concerned. You can pick up your own Bright Starts Baby Playplace at the Bright Starts website or you can pick one up on Amazon!